Icons, graphics, and resources made by happy_harper13 & mancalahour. Please credit when using and comment when taking. Stealing is frowned upon. Flailing is encouraged. The last 4 are from a texture battle a long time ago, and made with lovely images from naginis and inner_sanctum. If you like what you see, please watch/join our community! I'm posting these before I officially sink into superhero movie withdrawal. These are for theiconquest, which is also, conveniently, my excuse for mixing Batman and polka dots. Thanks so much for stopping by! If you can, I'd love it if you commented. It feeds my muse ego. Any numbers, constructive criticism, comments on which icons or textures you find the nicest or most useful, single words, punctuation marks, or anything in between all make my day. Thanks so much to all of you guys who have done that on previous posts. It's seriously been so helpful, and I really, really appreciate it. P.S. If you like what you see, please watch/join our community! I've been meaning to post these icons for quite some time. I have a bunch more that I've done since, mostly for theiconquest, but I figured I ought to finally get these guys up first. It feels kind of weird posting these on 9/11. Major thanks to the anons at anon_icon who helped me figure out which icons to use for the preview and which to cut in general. 3. If you like what you see, we'd love it if you decided to watch or join mosaically. 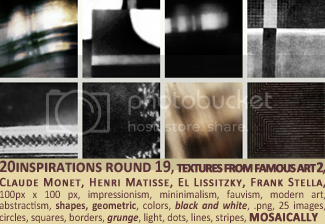 I'm posting a much larger set of 65 textures that I've been working on for months and am really excited about. I'm way psyched to say that I can totally vouch for the usability of these as a lot of my favorite icons that I've made have been with textures from this set. 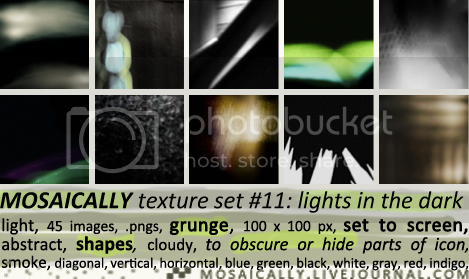 Per usual, you can download the set at DeviantArt or view and download individual textures, both through the lj cuts. Anyway, enjoy, and stay fab! 2. I'd strongly prefer that you credit me and mosaically if you end up using them. 3. If you like what you see and want to get updates when we ( mancalahour or I) post more textures, as well as icons, tutorials and more, please consider watching or joining MOSAICALLY. 8 icons + 1 wallpaper [Thor] for a_mused! 3. Please don't steal/hotlink/use as bases. I'm just posting a small set that's been sitting on my hard drive for months now. This set was inspired by the fabulous ellaangelus and her gorgeous light textures, and by the wonderful rebel, whose textures you should also check out at criminal. 2. Please credit if snagging. 3. If you like what you see and want to get updates when we ( mancalahour or I) post more textures, Wire graphics, and more, please consider watching or joining MOSAICALLY. ETA: THE DOWNLOAD FOR THE SECOND SET IS NOW FIXED. YOU CAN NOW DOWNLOAD IT AS A ZIP AT THE DEVIANTART LINK. SORRY FOR THE MIX-UP. Also for the capslock. Here lies yet another 2 texture sets. This one is ~different~, although not in a way that actually impacts their usability. This time, I started with images of famous artwork instead of stock images. 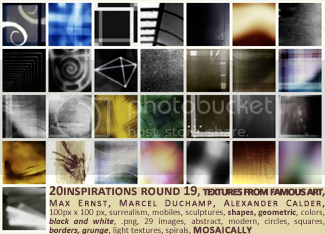 The theme this month at 20inspirations was famous art, and, once again, I started making icons and got distracted by all the cool shapes, colors and surfaces and ended up making textures instead, although this time I'm totally gonna finish my icon set too. Anyway, here are both famous art-based texture sets. 20 icons + alternates for my first ever round at inspired20in20. TV: Legend of the Seeker, Once Upon a Time, Doctor Who, Game of Thrones, Skins, Sherlock, Merlin, Misfits. Films: Eternal Sunshine of the Spotless Mind, Harry Potter, The Fall. And finally, a plea: I have several challenges I want to get done this month (fingers crossed I can finish them all!) and I would very much like to claim a movie, since I rarely icon them. Unfortunately, since many cap sites have been closing down, I can't find screencaps of Brick or The Science of Sleep. If anyone knows where I might find caps, or if anyone's willing to cap it for me, I'd be so grateful! ♥ If you like incentive, maybe I could do a request for you or something ;). I'm finally beginning to catch up on posting my backlog of textures, and I decided to start out of order with my 9th texture set because it's the one that's been the most fun to make. There are 43 unique textures in this batch, along with 4 black-and-white versions of textures in set 8 that I made for innocent_lexys's texture battle a while back and 2 variations of other textures in this post. Related notes and credit are at the bottom of this post here. View and save individual textures HERE.